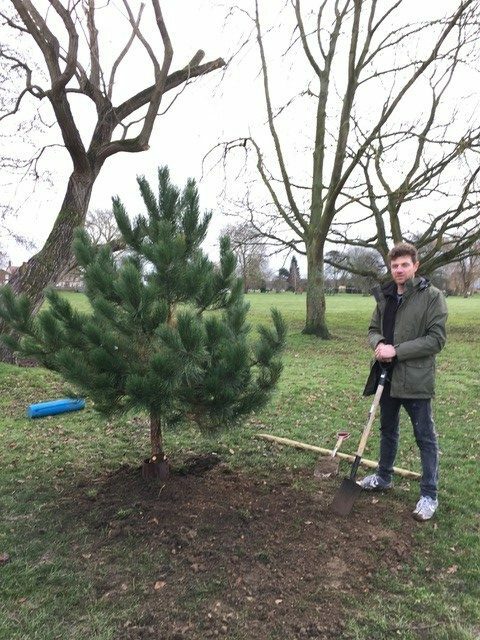 The Town Council has now completed the tree planting programme on the Recreation Ground and on Queen’s Walk for the current planting season. Councillors and volunteers have planted eleven new trees this year to add to the council’s “amphitheatre of trees” project. This is intended to create a wonderful display in all seasons of the year. Flowers in the spring, an interesting variety of foliage in the summer and masses of colour in the autumn. This new pine tree will add winter interest and also be a haven for wildlife in the colder months. As part of this project some of the older unhealthy sycamores and ashes, suffering from ‘die back’, will begin to be taken out in future years as the new trees begin to mature.